It’s not as complicated as you may think! At Brown & Medina Nutrition our experienced group of Registered Dietitians provides you with the foundation and tools to make healthy, mindful eating a part of your life. We custom tailor our care to meet your needs. We are here to provide guidance to treat not only what is but to prevent what could be. Looking back, of course this is where we were meant to be! Side by side, collectively and collaboratively pursuing our passions, doing the work that speaks to us. We first met nearly 18 years ago at our then nutrition practice led by Joy Bauer. We have shared so much throughout these years both professionally and personally and have unbreakable respect for one another. We have leaned on, learned from, supported and championed each other throughout the years and are no doubt better for it. We always wanted a place where our dietitians felt similarly. A place where they could grow professionally and personally and where they felt acknowledged for their commitment and hard work. Our team of clinicians mirrors the way we feel about our work and we are inspired by them. We are deeply grateful to be able to work with such a prestigious group. Our group of registered dietitians are all trained in clinical nutrition. Dietitians are only credentialed once they fulfill both the didactic work as well as the clinical work which is conducted in settings such as hospitals, long term care homes and other community facilities. Once the clinical and didactic work is complete they must sit for the registered dietitian's exam to ultimately receive this credential. On-going continuing education is mandatory keeping them on the cutting edge of their field. This process and on going educational goals is what sets us apart from other health care providers referring to themselves as nutritionists. Our clients come to us for all types of nutrition related concerns. We treat each case individually and confidentially. Our goal is to set you up for a life of health and wellbeing; no quick fixes or gimmicks. We provide instruction, counseling and coaching to bring about meaningful change. At Brown & Medina Nutrition we are all Registered Dietitians. Our complementary group of clinicians treat all ages, genders and medical presentations. Our eating disorder nutrition specialists have nearly two decades of experience working with males and females of all ages in the treatment of anorexia nervosa, bulimia nervosa, binge eating disorder, emotional eating, night eating syndrome (NES), disordered eating and selective/picky eating. We work with our clients to create a unique program that meets their nutritional needs. We collaborate as part of a treatment team including their doctors and therapists collectively moving the client toward recovery. Depending upon the family make up and age of its members, we can work with a family as a whole or work individually with the child or parents. In many cases, children are more open to the advice and encouragement from a professional outside the family unit. Our pediatric nutritionists present nutrition wellness programs in both the public and private NYC schools. We aid in the development of the nutrition curriculum for health classes as well as the creation of healthy menus for school and camp cafeterias. We offer a sustainable lifestyle approach customized to your schedule, professional and family demands, dietary restrictions and palate. We are skilled in addressing any and all dietary restrictions. We coach, help identify offending foods and piece together a style of eating suited to our clients’ particular sensitivities. Our clinicians are proficient in the FODMAP diet, which can be beneficial for many suffering with IBS. Our dietitians are experts in helping clients achieve the body their art or sport requires. Whether athletes dedicated to improving their performance, dancers (ballet, modern, and theater) who need to attain a “sleek physique”, models who need to eat for sustainability, or individuals simply wanting to maximize their workouts, our team of RD’s will get them there! We help simplify this process and provide clearly defined meal planning and guidelines to help avoid the offending foods while meeting the nutritional needs of all ages. 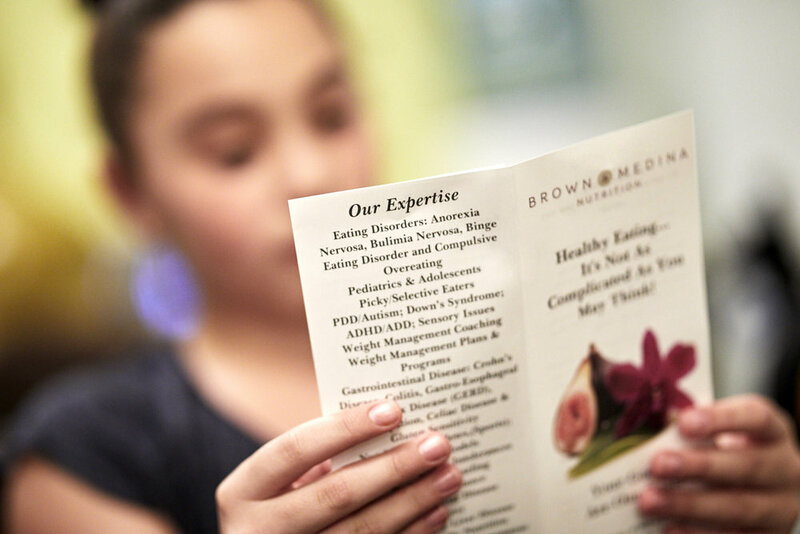 At Brown & Medina Nutrition our Certified Diabetes Educators (CDE’s) have the expertise to educate and formulate plans for those with Type 1, Type 2, Gestational and Pre-Diabetes. Our clinical dietitians treat the gamut of issues including hyperlipidemia (high cholesterol and elevated triglycerides), hypertension (high blood pressure), cardio-metabolic syndrome and low HDL levels (the good guys). The powerful effect of good nutrition and healthy eating will be apparent in productivity and also your bottom line. At B&M we create a program tailored to your employees’ needs and offer both individual and team building activities. Employees who follow a weight management plan miss fewer days, have more energy, and think more clearly. Food Education: We offer in house presentations in the form of a comprehensive lecture, a series of mini lectures or a lunch and learn set-up. Group Lecture/Seminar: We define our approach in collaboration with each corporation’s human resources department to develop programs tailor made to the needs of the employees. We will help direct you in the process of defining program objectives to allow for the highest impact. Private Consultations: We are a comprehensive private nutrition practice and our breadth of expertise and the size of our team make us well suited to meet the demands of both large and small corporations. We provide in-house private nutrition consultations as well as entertain corporate clients for private consultation at our conveniently located midtown Manhattan office. Cafeteria Food Planning: We work with the cafeteria and executive dining room chefs and staff to the refine menus thereby meeting the needs and desires that have been identified. Preventative care is of paramount importance in reducing absenteeism and medical leave. We look forward to hearing from you to discuss the details of your programming. Please inquire about our corporate rates. This package includes (10) ten 30 minute sessions following the initial consultation. At this first consultation your nutritionist will develop a comprehensive weight management plan based on your lifestyle and food preferences. Following this will be 10 weekly appointments designed to provide accountability, motivation and ongoing coaching. This package includes (5) five 45-minute follow-up sessions following the initial consultation. The sessions can be used during your pregnancy to optimize your health and to establish essential building blocks of growth and development for your baby. You can also start the package post-pregnancy to learn how to maintain health while losing the baby weight and/or to learn how to eat wisely while breast-feeding. This package includes (10) ten 45 minute sessions following the initial consultation. The package is designed for athletes of all types and levels including runners, dancers, gymnasts, the team sport athlete, and for those who are serious in the weight room. Throughout the 10 sessions, your nutrition coach will modify the plan to accommodate changes in your training routine and/or body composition and identify and troubleshoot the barriers to reaching your nutrition goals. This package includes (3) three 45 minute sessions following the initial consultation. It’s designed for the rising college freshman preparing to live on campus as well as for any college student grappling with dining halls, meals out with friends, late night snacking and “partying”, or students responsible for preparing their own meals for the first time.